Roxas then created the Central Bank Council to prepare the charter of a proposed monetary authority. It was submitted to Congress in February 1948. By June of the same year, the newly-proclaimed President Elpidio Quirino, who succeeded President Roxas, affixed his signature on Republic Act No. 265, the Central Bank Act of 1948. Over the years, changes were introduced to make the charter more responsive to the needs of the economy. 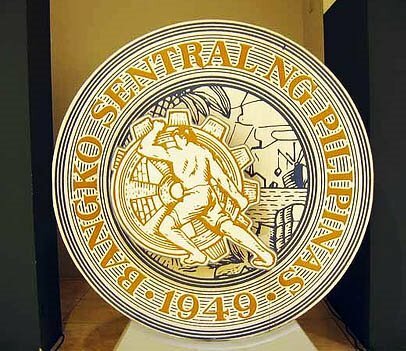 The Bangko Sentral ng Pilipinas, as it today, has fiscal and administrative autonomy with primary objective of being the maintenance of price stability as mandated by Republic Act No. 7653 of 1993. Below is the full text of President Quirino's speech at the inauguration of the Central Bank on January 3, 1949. TODAY, as we inaugurate the Central Bank, a historic scene in our financial and economic history unrolls upon the national stage. We are taking a decisive step in economic self-assertion. When in 1933 we minutely scrutinized the provisions of the Hare-Hawes-Cutting Act which had divided our country into two schools of thought, we delved deeply into the economics of our independence. A group of men who later formed the Philippine Economic Association then envisaged and advocated in a book eventually published as a result of their studies, the organization of the Central Bank as a means of insuring our economic progress and stability and providing the firm basis of our political independence. For reasons which I need not here mention, although the plan was everywhere lauded, we did not find fertile soil for its germination and growth. The chief impediment was the lack not only of means and experience but of sovereign authority to accompl sh it. When therefore I signed the bill creating the Central Bank a few months ago, I hailed it as the Charter of our economic sovereignty; for, indeed, its significance to the economic life of the nation may well be compared to the Constitution that governs its political life. The passage of the Central Bank law, together with the general revision of our banking legislation, aside from the great number of constructive measures which became law, constitutes the most far-reaching achievement of our Congress. The present composition of the Monetary Board has merited the unanimous endorsement of our people. In itself, the quality of the men chosen for the Board inspires the people's confidence in the success of the Bank. We have long felt the need of banking and currency reforms. As we carry out our program of development in an effort at total economic mobilization, the Central Bank becomes both a challenge to our ingenuity as a people as well as an opportunity to show our creative faith in our economic future. We aspire for full employment and development. Our natural resources must be completely and efficiently utilized if we are to survive as a nation. The Bank should encourage the development of infant industries and the establishment of new ones by giving both the proper and due incentive in financing them. Home production of our primary and vital needs must at once be given impetus. The last war has shown not only resourcefulness of our people but possibilities of expansion in many of our material endeavors. We may need economic and financial reorientation to adapt ourselves to the new situation in which we find our people struggling along with the whole world for peace and contentment. We must insure an increasing fullness of life for all our people. In coordination with the work of the National Economic Council, I charge the members of the Monetary Board with the duty to employ the full measure of their vision and intellect in order to achieve this goal. The Bank being the central dynamo to generate the life-blood to nurture our economic structure, the nation will henceforth focus its attention on the manner in which the members of the Board discharge their tremendous responsibilities. All the activities, public and private, in the agricultural and industrial order, as well as in the financial and commercial field, shall revolve around this central financial institution. Its operation will be a test of our economic judgment and competence as a people. The extent of its success or failure will be the measure of our name in the financial and economic world. Great as our hopes are for the success of this new instrument of our national advancement, of this necessary and effective machinery for our rehabilitation for the supply of the full monetary requirements for the immediate realization of our productive possibilities, our great concern should be that in its operation the stability of our currency should not be sacrificed. In the credit operations of the Bank providing for the requirements for capital funds in our varied enterprises, great care should be exercised to guard against the dangers of inflation. Increase of investments is an essential requisite to raising productivity. To promote a higher rate of capital formation, it will be necessary to encourage and accelerate our rate of savings that should be channeled in heavier volume into investment projects. Hence, the immediate necessity to create a government securities market for increasing the mobility of the country's idle cap-tal. We need to reawaken our people into increasing fruitful investment and to inspire proper confidence in canalizing their savings through government securities. I hope that this undertaking will receive the support of all elements in the country. Recognizing the dangers involved in inflationary financing of our economic rehabilitation and development by undue expansion of credit, the Government has already taken important steps to control expenditures and increase the revenues from all sources. Measures have been adopted to reduce the importation of luxury and non-essential articles. To promote economic stability, the fiscal policy of the Government and the monetary and credit policies of the Central Bank should and will be properly coordinated. Onlyi thus can the Bank promote a rising level of production, employment, and real income, and, at the same time, maintain the internal and external stability of our currency. Under the wise guidance of the Monetary Board in whose members' ability and patriotism I have an abiding faith, it is my fervent hope and firm conviction that the nation will evolve well-coordinated fiscal, monetary, and banking policies consistent with sound economic development and the requirements of continued monetary stability. Its Charter has make the Bank the jealous guardian of the value and convertibility of the peso. This shall be preserved-and more. But the Bank shall also be the zealous medium of international financial cooperation in the great work of making this our land a land of plenty. God willing, we expect to see in our time the realization of every individual's dream that within our shores the enjoyment of a handsome portion of the material and cultural blessings with flow from an economy of abundance. This is our goal. In an environment as generously endowed as ours, the essence of economic statemanship consists in providing the stimuli that will encourage the citizenry to take full advantage of all the productive possibilities that lie in wait and in so doing, generete rising level of employment and an ever increasing flow of our social dividents. In this spirit, in this expectation, in this hope, I declare the Central Bank open today. American Chamber of Commerce of the Philippines, Volume XXV, Number 1, January 1949.